This one was Truck 6. In time, some of these were cut down into pumpers by the department shops. Any photos of one of these would be greatly appreciated. The last of the San Diego quints went to T-5. Eventually, all four were scrapped. The Aero Chief that once protected the home of the Baseball Hall of Fame was later sold to Stottsville, NY. Protecting the back lot of Pittsfield Station 2 is where I found this rusted out Aero Chief 80 quint. A short time later, it was also sold to Stottsville, NY. The unique U-shape of the lower boom of the Aero Chief allowed the upper boom to sit inside it, providing a more compact unit. Competitors booms stacked on top of one another creating a taller unit. The travel height of an Aero Chief 90 could be as low as 9' 7". Another example of the small door size required to house an Aero Chief 90. This station in New Brighton only had a 10' door. This Aero Chief is currently up for sale. 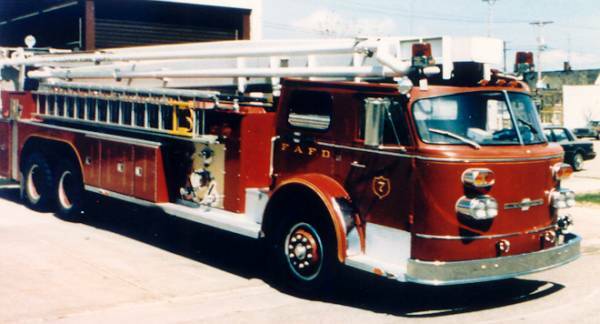 This well equipped, low profile quint served South Windsor for many years before being sold to the Bronson, MI. FD. One of the most recent additions to this project, this 90' quint was sold to Harbor Beach, MI. in 1991. This one's a bit different! In order to meet newer standards that required all crew members to ride inside, Newington had their Aero Chief 90 refurbed with a fully enclosed Ranger cab. 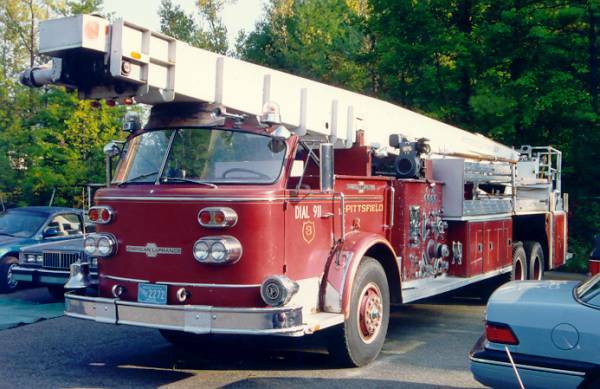 Shelby still runs this Aero Chief 80 quint as their only aerial. 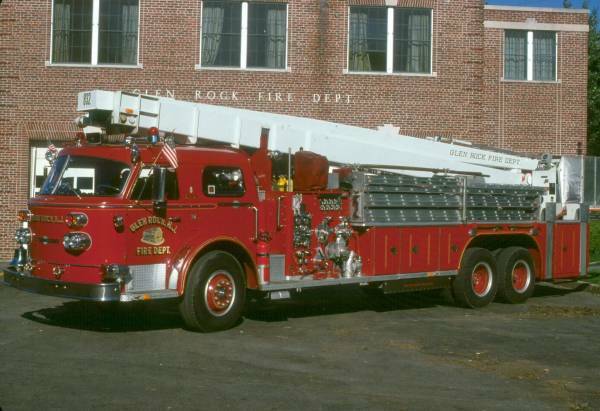 After years of service in Glen Rock, this rig was stripped of it's firefighting componants and converted into a car hauler for a junkyard in Passaic, NJ. This Aero Chief 80 quint still serves Sanford as a reserve piece. This Aero Chief was originally delivered in white, but was repainted white/red later on. The silver rear wheels and chrome wheel covers on the front give this 80' quint a classy appearance. This rig was later sold to the College of San Mateo, CA. Delivered new to Fairview, NY, this Aero Chief 80 quint serves Conklin, NY today. Here's another Aero Chief that had an untimely meeting with the ground! While fighting a fire in a snowstorm, the boom on Erie's Aero Chief 90 iced up and tipped the rig over. It was later sold to the Chabot Coal Company in Keene, NH. This Aero Chief 70 was later sold to Bonham, TX and repainted red. Relatively few Aero Chief's were painted white. Tualatin's big quint was sold to a collector in Joseph, OR.